Hello everyone, Having owned 11 Motorhomes since 1991, I’m thinking of buying a Worcester, can anyone advise on anything I should be aware of regarding problems, and what fuel consumption I could expect from the Mercedes 2.2 Auto 7 Speed. Having owned AS models many years ago, I know that the quality is better than most, and the service at the factory used to be excellent - is it still the same ? Many thanks. Welcome from N.E Wales. . Can't help with Worcester but can confirm that service at the factory is still excellent. Thanks, it’s good to hear that ! Being only 30 miles or so away, there’s no point visiting a dealer with parts not readily available ! The spares dept is excellent , I think the lady there is Katherine (but that could be wrong) and service manager is Mark Burdett. Hi, Was thinking of coming to Sunny Bridlington next week, to look at a Broadway - then I found the Worcester ! Thanks, hope to get sorted soon, at winter prices ! Only one Worcester for sale on Autotrader (Oaktree, Nottingham) . As regards winter prices, I don't think they exist any more except to clear 2017 vans to make way for new arrivals. Back in March there were 425 AS's for sale on Autotrader, now 385 ( went as low as 360 couple of weeks ago) so dealers know there is a shortage and don't need to offer much discount. Good luck with your search. Clearly a man of taste! We have owned our Worcester since 2012 and it is the best van we have ever owned, ultra comfortable, masses of payload and a dream to drive... you will not be disappointed. Very rare to find one too! PM me if you would like any other info, happy to help. Have viewed the one at Oaktree - it’s a nice van. There is one at Stewart Mouland, Sussex too. Oaktree have a mint Broadway with rear washroom. Heart says the Worcester, but head says Broadway ! Need the fuel consumption figures for the Worcester 2.2 Auto. Will have to make our minds up soon. The Oaktree van shows a weight of 4000kgs, has it been uprated? Also are you sure it has a seven speed auto gearbox? For me I would choose the Worcester just because it is an automatic and on the Mercedes, but we all want different things. You have owned many motorhomes before so will make the right decision for you I am sure but I do not think MPG would be that different between the two. Thanks for the info, not as bad as I thought - my old Mohican 3.0 used to manage 19 when cruising around 65-70 . How can I tell an old 5 speed Auto from the 7 speed without driving it ? Is the gearshift marked in a different way ? Think Oaktree may have used library information for the weight ! I stand to be corrected but the 7 speed auto box was not available on the Sprinter until some time in 2013 for 2014 model year at which point the Worcester transformed in to the Winchcombe anyway. The new style Sprinter came along in 2014 so you might even get a Winchcombe for around the £50k mark? The 5 speed auto is really smooth by the way and has the manual override function as well. So Oaktree are wrong in their description in more ways than one ! 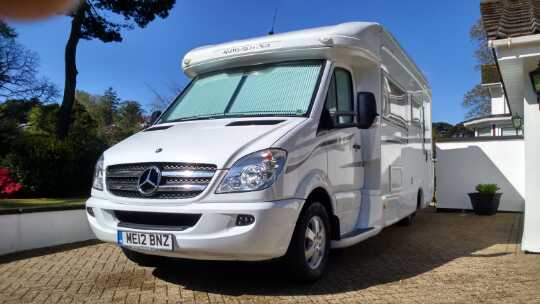 There’s a gorgeous Winchcombe at Nick Whale Motorhomes, Evesham but it’s a 2015, and a couple of quid short of £60k. It’s the only one I’ve seen for sale. Back to the drawing board - can I ask your opinion on the Cotswold ? By all accounts, not very popular. The Cotswold was AS first attempt at a bigger van. It was renamed to Broadway FB so, in facelifted form, is still about and is a popular van. The Worcester at Stuart Mouland is a later model and has been on their site a while my be a cracking deal there? Thanks Peter and Groundhog, It’s worth a look at both. Jonesie wrote: Hi, Was thinking of coming to Sunny Bridlington next week, to look at a Broadway - then I found the Worcester ! Was it the End lounge at Springfields, ? They have a Surrey too, both nice vans. It was the 14 plate Broadway, with the end washroom - it’s on fleebay too ! I’m back again, still looking for a decent Worcester, just found a Winchcombe at Preston Caravans. Has anyone any experience of this dealer, or is the previous owner on here somewhere ? How can I tell without seeing the van if it’s a 5 speed or the 7 speed - I know they were introduced in 2014 ish. Here is one..... I would sell it to you but there is nothing to replace it with! Thanks Groundhog, I think I’ll reserve the one at Preston for Friday - working nights, I can’t get there before. Have just emailed Auto-Sleepers, to check which gearbox it has. Decent vans are like gold dust - don’t really want a Peugeot Broadway - you know where you stand with a Merc ! Thanks Groundhog, I think I’ll reserve it tomorrow, , as I’m heading north next weekend anyway - I’ll make a detour before heading over to Newcastle.